To Cite: Narooie-Nejad M, Rigi E, Torkamanzehi A, Rohani M. A Study of CYP1B1 Gene Prevalent Mutations in Patients With Primary Open-Angle Glaucoma in Sistan and Baluchestan Province, Iran, Gene Cell Tissue. 2016 ; 3(2):e33668. doi: 10.17795/gct-33668. Background: Glaucoma is the second leading cause of blindness worldwide, and it is associated with increased intraocular pressure and visual field loss. The most common type of glaucoma, primary open-angle glaucoma (POAG), involves progressive optic nerve damage and the death of ganglion cells in adults. Despite the unknown etiology, genetic predisposition plays a significant role in the development of the disease. Objectives: In order to identify the genetic basis of POAG in Zahedan, Iran, three common mutations of the CYP1B1 gene (G61E, R390H, and R469W) were evaluated in this study. Patients and Methods: Forty patients with POAG were recruited from the ophthalmic divisions of Alzahra hospital, which is associated with Zahedan University of Medical Sciences. The CYP1B1 prevalent mutations of p.G61E, p.R390H, and p.R469W were identified in DNA extracted from the blood samples of patients using the polymerase chain reaction-restriction fragment length polymorphism (PCR-RFLP) technique. Results: We identified no mutations in these patients in the three screened positions. Conclusions: To ensure that these genes play no role in the disease, evaluation of the non-coding regions of both the CYP1B1 and MYOC genes is strongly recommended, since other genes are involved in the pathogenesis of glaucoma. Copyright © 2016, Zahedan University of Medical Sciences. This is an open-access article distributed under the terms of the Creative Commons Attribution-NonCommercial 4.0 International License (http://creativecommons.org/licenses/by-nc/4.0/) which permits copy and redistribute the material just in noncommercial usages, provided the original work is properly cited. Glaucoma is a group of progressive neuropathies of the optic nerve, which are characterized by a decline in the retinal ganglion cells and then optic nerve damage, thereby contributing to a specific pattern of irreversible blindness if left undetected or not treated in time. The disease is the second leading cause of blindness worldwide after cataract (1). Glaucoma has been classified into many categories based on etiology (primary or secondary), anatomy of the anterior chamber (open-angle or angle-closure glaucoma), and age of onset (congenital, juvenile, or adults glaucoma) (2). Primary open-angle glaucoma (POAG; OMIM #137760) is the most common form of glaucoma in adults. POAG is associated with increased intraocular pressure (IOP) in those of advanced ages. In most cases, a family history of the disease can also be attributed (3). Many loci have been identified for glaucoma, although the main molecular mechanism of the disease remains unknown (4). However, a few genes have been identified as contributing to POAG, including the MYOC gene (OMIM #601652) on chromosome 1q24.3, the WDR36 gene (OMIM #609669) on chromosome 5q22.1, and the OPTN gene (OMIM #602432) on chromosome 10p13 (1, 5). Further studies have revealed the co-inheritance of multiple genes in glaucoma. In France (6, 7), India (2), Iran (8), Spain (5), and many other areas the simultaneous role of the CYP1B1 and MYOC genes in the occurrence of the disease has been observed. The CYP1B1 gene (OMIM #601771) is a major cause of primary congenital glaucoma (PCG; OMIM #231300) and it encodes a 543-amino acid CYP1B1 protein as a member of the cytochrome P450 family (6, 7). It is located on chromosome 2p22.2 and consists of two coding exons. The CYP1B1 gene is the gene usually linked with primary congenital glaucoma, although mutations in the CYP1B1 gene have been reported in individuals affected by primary and juvenile open-angle glaucoma as well (7). In the current study, the presence of the most common CYP1B1 gene mutations (p.G61E, p.R390H, and p.R469W) (2) was investigated in 40 POAG patients from Zahedan in Sistan and Baluchestan Province in the southeast of Iran. In this study, 40 unrelated POAG patients were recruited from the ophthalmic divisions of Alzahra hospital, which is associated with Zahedan University of Medical Sciences. All of the patients were diagnosed by glaucoma specialists. The examination involved gonioscopy of the angle, slit lamp biomicroscopy, evaluation of the IOP, and fundus perimetry. Elevated IOP (more than 21 mmHg) and optic disc cupping in at least one eye were considered as specific symptoms of POAG. Patients with other ocular or systemic anomalies were excluded. All participants provided written informed consent according to the declaration of Helsinki and the accepted codes of the university ethics committee. (2F: 5’-GCATGATGCGCAACTTCTTCACG-3’; 2R: 5’-TCACTGTGAGTCCCTTTACCGAC-3’). The coding region of exon 3 was amplified with primers: (3F: 5’-AATTTAGTCACTGAGCTAGATAGCC-3’; 3R: 5’- TATGGAGCACACCTCACCTGATG-3’). The amplicons of exon 2 and exon 3 included 757 and 872 nucleotides, respectively. The restriction enzymes used for p.G61E, p.R390H, and p.R469W were TaqI, HahI, and AciI (Fermentas, Vilnius, Lithuania), respectively. 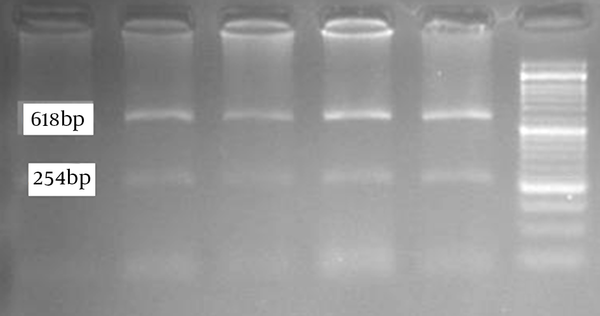 The PCR-RFLP products were evaluated using electrophoresis on a 2% agarose gel and then visualized with ethidium bromide staining. In the current study, 40 POAG patients with a mean age of 47 ± 14 years and a mean age of onset of 46 ± 12 years were genotyped for the prevalent mutations of G61E, R390H, and R469W in the CYP1B1 gene. Some 52.6% of participants were male and 47.4% were female. The mean cup/disk ratio for both the right eye (OD) and the left eye (OS) was 0.7 ± 0.2. Approximately 74% of the patients had no history of trabeculectomy, while 19.4% had a history of surgery in both eyes and the others had had just one eye surgery. As all of the patients received medications at the time of this study, all of them had a controlled IOP of 18 ± 6.7 mmHg for the OD and 16.8 ± 3.7 for the OS. Although a prior study had demonstrated that the three abovementioned mutations in the CYP1B1 gene cause more than 50% of glaucoma in central and western Iran (2), we identified no mutations in the participating patients in the three screened positions. The results of two patients were confirmed using direct sequencing of the coding exons. 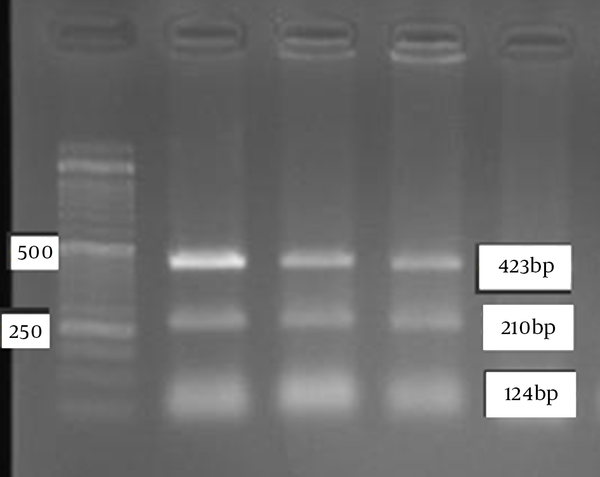 The TaqI restriction enzyme digests the PCR product of a fragment of exon 2 with a length of 757 bp, and it creates three pieces of 423 bp, 210 bp and 124 bp in a normal sequence. All of the patients showed this pattern of digestion, so all of them were considered as normal (Figure 1). The HahI restriction enzyme digests the PCR product of a fragment of exon 3 and creates two pieces of 618 bp and 254 bp in a normal sequence. All of the patients and their parents showed this pattern of digestion. The p.R390H mutation occurs at nucleotide number 1169 (A to G), and then there is no restriction enzyme cleavage for HahI (Figure 2). 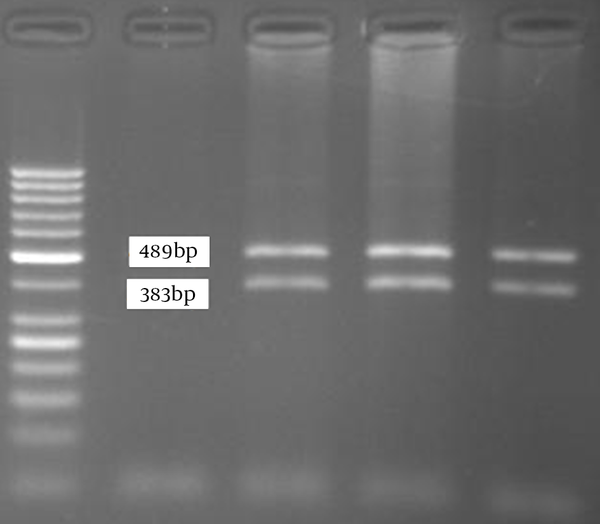 After the digestion of the PCR product of exon 3 of the CYP1B1 gene by the AciI restriction enzyme, normal sequences appeared with two pieces of 489 bp and 383 bp. The digestion results of each of the 40 patients were similar, with no mutation found in this position (Figure 3). None of the patients examined in this study showed any of the abovementioned mutations (i.e. p.G61E, p.R390H, and p.R469W of the CYP1B1 gene). The results of the RFLPs were confirmed by direct sequencing of the amplicons using an ABI Prism 3700 instrument (applied Biosystems, Foster city, CA). Glaucoma is a group of progressive neuropathy of the eye that are associated with optic nerve damage. The disease causes a reduction in retinal ganglion cells and then leads to visual field loss, which makes glaucoma the second leading cause of blindness worldwide after cataract. It has been shown that a family history of glaucoma is a risk factor for developing POAG. Hence, an individual’s genetic background is considered to be one of the most important criteria in the patient evaluation. Although the CYP1B1 gene was first identified in relation to primary congenital glaucoma (6) and the MYOC gene to primary open-angle glaucoma (9, 10), further studies proposed the complex relationship of these genes in the development of glaucoma. In a study conducted in 2002, the CYP1B1 gene was found to be the cause of 5% of all juvenile open-angle glaucoma (11). This study was the basis for further research in this area among other populations. Then, the role of the CYP1B1 gene mutation in POAG patients in different populations was studied. Mutation in the CYP1B1 gene correlated with POAG in one population in India (12, 13), although it proved rare in other studies in India (14), Iran (15), Spain (7), Pakistan (16), and China (17), albeit not in all studies (18). On the other hand, some studies revealed correlations of mutations in the MYOC gene with primary congenital glaucoma in some populations (19, 20); hence, the other studies rejected this finding (21, 22). In a study involving patients affected by primary congenital glaucoma that was conducted in Iran in 2007, the p.G61E, p.R390H, p.R469W mutations were introduced as the most common disease-causing mutations (2). In 2008, patients with primary open-angle glaucoma were evaluated for mutations in the CYP1B1 and MYOC genes. Mutations in both genes were found to be equally involved in the disease. The p.G61E and p.R390H mutations in the CYP1B1 gene were the cause of 17.4% of instances of the disease, on a homozygous state (15). Since no prior research had been conducted in the southeast of Iran with regard to the genetics of glaucoma, we did not know which gene or genes are involved in the disease. Thus, the purpose of this study was to take the first step in identifying the genetic basis of glaucoma in this area. Some forty unrelated patients with primary open-angle glaucoma who were referred to the ophthalmic divisions of Alzahra hospital participated in this study. As none of them showed any mutation in the coding exons of the MYOC gene (data not published), all of the patients were subject to the evaluation of three common mutations in the CYP1B1 gene (p.G61E, p.R390H, and p.R469W) using the PCR-RFLP technique, but none of the patients showed these mutations. To ensure that these genes play no role in the disease, evaluation of the non-coding regions of both the CYP1B1 and MYOC genes is strongly recommended, since other genes are involved in the pathogenesis of glaucoma.